This post will be referencing some plot points from the most recent season of Game of Thrones. If you’re not caught up, you’re on your own should you continue to read. Lord Randyll: That spoiler warning seems a tad over-wrought for my taste. In my day, we’d brave one hundred spoilers before breakfast. My son Sam, on the other hand, would eat one hundred breakfasts. And not brave anything. 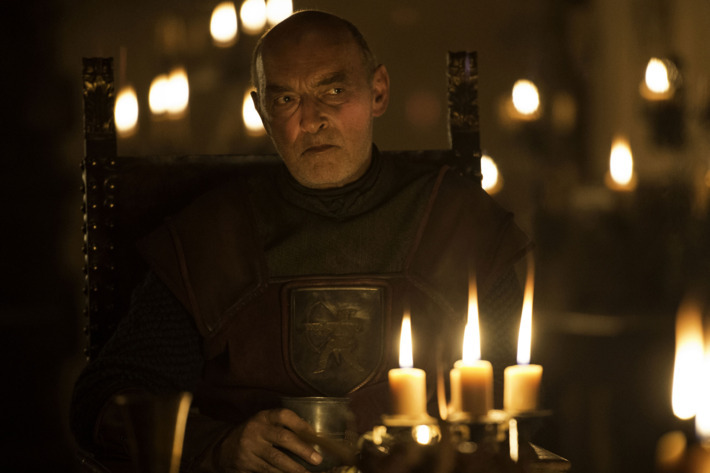 Midway through the sixth season of Game of Thrones, viewers met with the cold and forbidding Randyll Tarly, Sam Tarly’s father. It wasn’t the most optimal family reunion between Sam and his father, leading up to Sam sneaking out of the house to head to college in Oldtown, and stealing the ancestral Valyrian steel sword of the Tarlys, Heartsbane. Sam: Oh, they’ll never miss it! Viewers wondered exactly when Lord Randyll would come to the Citadel where Sam would be studying, to retrieve the priceless heirloom of his House. The answer is never, apparently. Sam spent his time at the Citadel, with no one from Horn Hill coming by to investigate if Sam had any large sword-shaped decorations in his student flat. So why would Lord Randyll be so lax in retrieving his stolen property? I can only imagine that things must have gotten busy in the Tarly household. Lord Randyll: Seven hells, Melessa. How long does it take to clean a Valyrian steel sword? Lady Melessa: My lord husband, whatever are you talking about? Lord Randyll: Aren’t you having Heartsbane polished? It’s not in its usual antlered realm. Lady Melessa: I haven’t bothered with it. Perhaps Dickon has been trying to impress the ladies again? Lord Randyll: Time to ride down to Oldtown and get back Heartsbane. Maybe murder my eldest. Dickon: Father, perhaps you should just send some men to take care of this. Lord Randyll: Nonsense. A man handles his own sword, if you know what I mean. Tarly Servant: M’lord, a raven from Highgarden. There is a memorial service planned for the Tyrell family members who were tragically lost in the recent Sept explosion. Lord Randyll: Ah, the mysterious “gas leak” explosion. Very well. I owe Lady Olenna my condolences. So, a quick trip to Highgarden, with the usual hob-nobbing and solemn feasting and so on. Then back on task. Lord Randyll: Time to ride down to Oldtown and get back Heartsbane. Maybe murder my eldest. Finally. Tarly Servant: M’lord, a raven from the capital. Your presence is requested at Queen Cersei’s court. Lord Randyll: Seven above! What does that woman want? Tarly Servant: I believe to discuss the defense of the realm against the return of Daenerys Targaryen and her foreign troops. Lord Randyll: Egad. Anyone else going? Tarly Servant: I believe the Fossaways, for sure. Lord Randyll: Red-apple or green-apple? Lord Randyll: Crikey! Those bastards will cut me out of any deal. Dickon, we ride for the capital! We’ll get the sword later. So, a quick trip to King’s Landing, with the usual waiting around for the other lords, and sightseeing where the Sept once was, etc. Then back home, and back on task. Lord Randyll: Melessa, we’re home! Lady Melessa: Welcome home! Will you be staying awhile? Lord Randyll: No, I need to get to Oldtown and get back Heartsbane. Lord Randyll: I do like trying criminals. I guess the sword can wait. Dickon: It’ll be nice to sleep in my own bed. Lord Randyll: Wimp. Destroy your bed and sleep on the ground! Lord Randyll: Ser Jaime. What brings you to the Reach? Ser Jaime: My troops are going to capture Highgarden and execute Olenna Tyrell for treason. She is conspiring with a foreign conqueror, who has brought some bad hombres to our shores. You should join in on this. Lord Randyll: You know, I’m not all that comfortable about that. 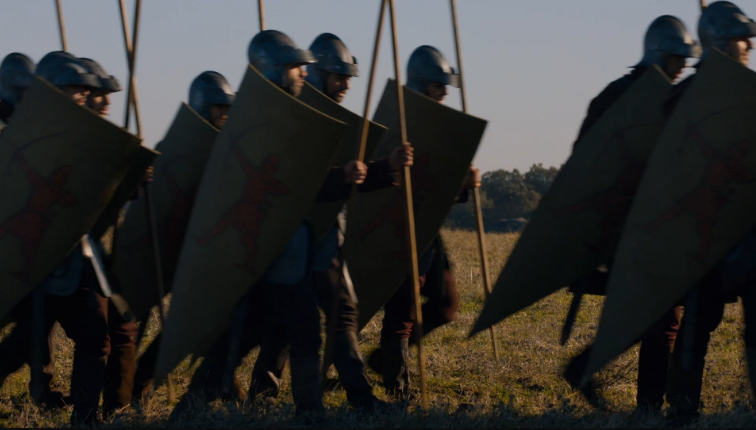 Ser Jaime: The Fossaways were eager to show their loyal support to our queen. And before you ask, both the red-apple Fossaways and green-apple. Lord Randyll: Dammit. Now I have to join in. Can you delay a week or so? I’d like to fetch my Valyrian steel sword from Oldtown. Lord Randyll: It’s being cleaned. It totally wasn’t stolen by my worthless eldest son. Ser Jaime: Oh. No, we really can’t wait. And I doubt you’ll need your Valyrian steel for the siege of Highgarden. I expect you’ll just be shouting orders to your famous left-handed footmen. Seriously. Why are the Tarly troops south-paws? Lord Randyll: Very well. It’s not like we’ll be encountering a dragon in need of slaying, eh what? Ser Jaime: Oh, and bring your son Rickon with you. 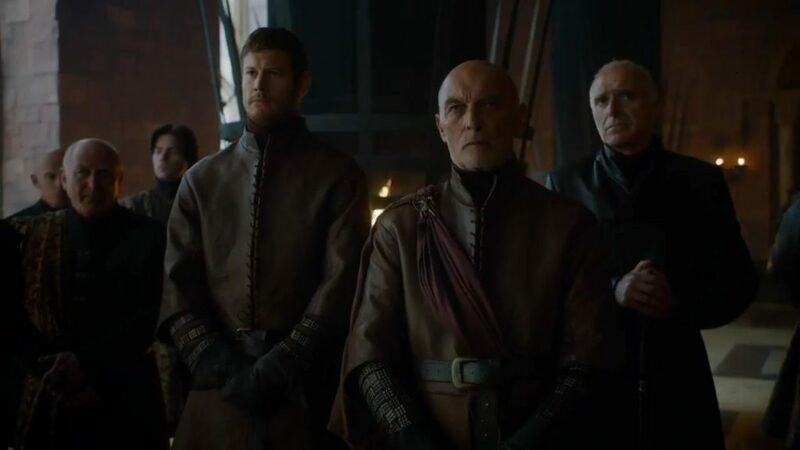 Lord Randyll: It’s Dickon. He’s named after my father, Dickard. Ser Jaime: Of course he is. Ser Jaime: Well, that’s that. I suspect you’ll be wanting to head to Oldtown now and acquire that sword. Ser Jaime: Fair enough. That sword isn’t likely to go anywhere, I suspect. Daenerys Targaryen: Have it your way, Tarly. 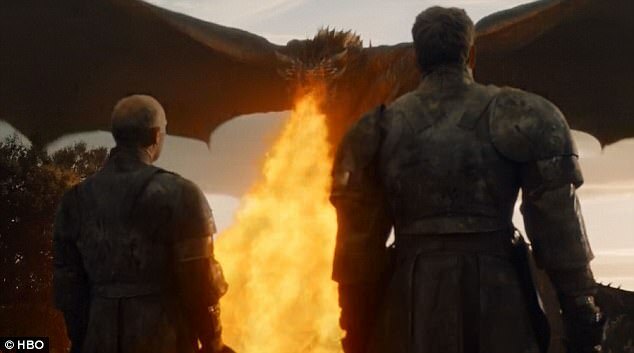 DRACARYS! Lord Randyll: Fine. This is just fine. Dickon: Dad, I just remembered that Sam still has Heartsbane. Lord Randyll: Crap, you’re right! Wait! So, it’s not like Randyll Tarly was neglecting picking up his stolen sword from his errant son. My man Tarly just couldn’t make the time. So remember kids, work might be important, but make time for family and familial things. You never know when you’ll be roasted by the dragon of a vengeful and tempestuous conqueror. I had completely forgotten about that sword… but then, GoT has a ton of detail. I’m rewatching the series because it’s so easy to forget a bunch of them. Yeah, he was the worst. I’m glad to hear you’re rewatching the series, that must be fun. You get to hear all of the characters say ironic things. Also, I forgot about Heartsbane. Like, entirely.